This guide describes 12 varied excursions on Islay that tell the fascinating story of Islay’s geological past from 2 billion-year old gneiss to the Ice Age. The geology of each walk is described at an introductory level with maps and photographs and the book also contains an introduction to geology section. For those with some geological background there is a section describing Islay’s geological framework in more detail with some key references for further reading. The walks range from leisurely rambles to more demanding longer excursions – most of which are readily adaptable with shorter easier options. Dr Roger Anderton has worked extensively on the sedimentology and tectonics of the Dalradian following his Ph.D. on the Dalradian of Islay, Jura and mid-Argyll. He now lives near Lochgilphead following a career at the British Geological Survey, Strathclyde University and in the oil industry. Dr Alasdair Skelton did his Ph.D. on the metamorphism of the Dalradian basaltic sills and has continued his studies on fluid flow in Islay and Argyll whilst pursuing an academic and teaching career at the University of Stockholm. 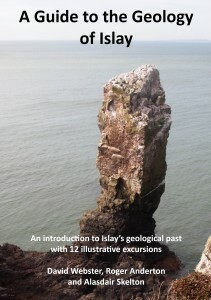 A Guide to the Geology of Islay can be ordered now for £14.99 +p&p. Order now using the Paypal facility below.